Parent Question: I don't have any solid routine in place for my eight-month- old. I would like to establish one as I feel Bradley's sleep patterns are not what they should be. He wakes on average twice a night after being put to bed anywhere between 7pm and 10pm. His day sleeps are only short and he is often cranky. I have just weaned him off the breast and give him three solid meals a day. Is routine important for bub? A routine is extremely important for every baby and the type of routine you will need should be appropriate for a 8 month old. It does not have to be strict and to the minute but rather, you need a set of guidelines, which you need to aim for. By 8 months it is realistic for Brad to be sleeping through the night, by that I mean, 12 hrs without any night feeds or night waking. Not only is this good for you but good for your son. He will wake refreshed and happy after a solid sleep not to mention the essential brain development that happens during sleep. At 8 months you should also expect him to have at least two sleeps a day; one in the morning and one in the middle of the day it is around this age, 8 to 12 months that the afternoon sleep drops off. Both these sleeps should be about 2 hours in length. If his afternoon sleep is no longer happening then it is essential that he still has rest time instead. The afternoon stretch is too long for children to sustain being up and involved in family life without a bit of a break and relaxing time. If he isn’t achieving these day sleeps, then I would suggest you work out a routine based on him being up about one and a half hours and then looking for his signs of tiredness and getting him ready for a sleep as soon as you see these. He should fall asleep after being put to bed in about 5 – 10 minutes. Any longer and he is overtired. Keep in mind the day sleeps should be approx. 2 hrs. If he is still sleeping after this time then let him. 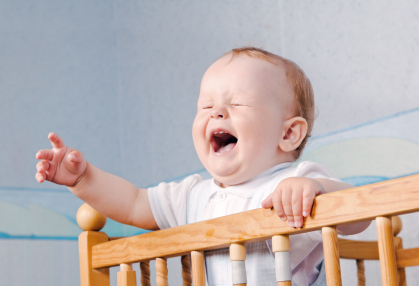 It is always best to let babies and children wake naturally at the end of a sleep cycle. I would draw up a routine with these guidelines and put it on your fridge or his door so you know what to aim for.